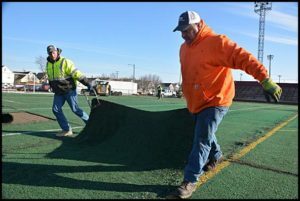 The 20-year-old artificial turf at Keyworth Stadium was recently torn out and will be replaced with new turf this month. 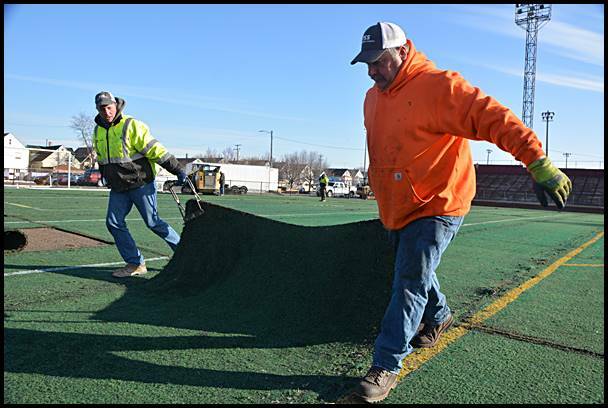 Keyworth Stadium’s old, worn out artificial turf is no more. A couple of weeks ago, a work crew began tearing up the turf for disposal. In about a month, a brand-new turf will be installed and ready for use. The new turf is the result of an $800,000 grant the public school district received from the Ralph C. Wilson, Jr. Foundation. The foundation also funded a master plan study on how to go about making improvements in Veterans Park, which is owned by the city. School and city officials joined forces to seek the grant, and they are in the process of seeking a grant worth $18 million to restore the city’s historic baseball stadium and build an entertainment complex there as well. The grant program is part of the foundation’s effort to get more kids physically active. The nation’s youth are overwhelmingly over-weight and too inactive. Nationally only 27 percent of kids play at least one hour a day, which is considered the minimum amount needed for kids to be healthy and in shape. In Detroit, it’s worse at 10 percent. Keyworth’s new turf comes just in time for the upcoming season for the Detroit City Football Club. The club’s first home game will be in May. In the meantime, the turf will get plenty of workout from local soccer players. The old turf was way past its expiration time. It was first installed some 20 years ago, and should have been replaced about 10 years after that. It had long ago lost its spring when walking on it, and for players – especially the high school football team — it could feel as hard as packed dirt when they got tackled on it. I wish it was “out with the old and in with the new” on The Review’s website in regard to the business directory. It’s 2019 and the 2017 directory is still up. Is it really that hard to update a PDF link?